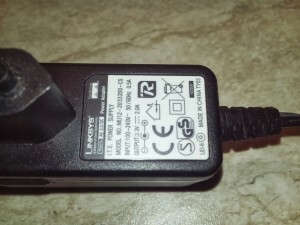 WRT54GC power supply label. A good reason to repair the power supply is that 3.3V 2A adapter is difficult to find. WARNING: Mishandling the repair of any power unit can lead to electric shock or fire, which can kill you or somebody else, or produce damage. Do not attempt this repair unless you are qualified for the task. Now that you have been warned I can continue with the rest. 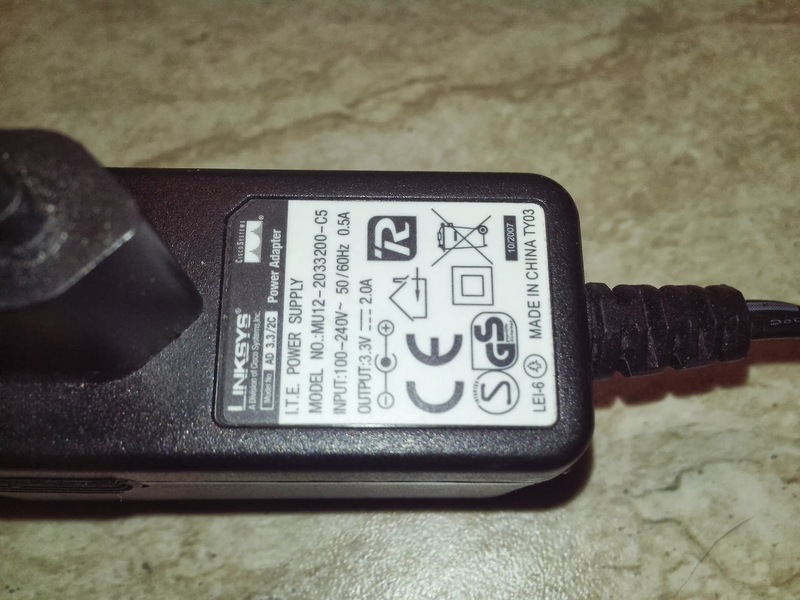 I’ve had a total 4 cases of failure of power supply adapters of Linksys WRT54GC routers for 4.5 years for 2 such routers. The first three failures were covered by the warranty, so what I had to do was just take the failed power adapters together with the routers to the service company. They replaced the faulty power units with working ones. The last failure happened several months ago. I found the router had a trend to hang more and more frequently. The power unit was getting extremely hot and the WRT54GC router which was powered by it was failing. I had handy a unit from another WRT54GC router, so I tested the router with it. It was clear that it was the next power unit failure in the series. It seems to me that the power units were either misdesigned, or low grade components were used. I saw that the warranty has expired. I had had quite good experience with various electronic devices, so I decided to repair the faulty WRT54GC power unit myself. The unit was sealed either by glue or by melting at high temperature, so I had to cut the line where the front and the back parts of the case join, using a thin saw, and then eventually with a cutter blade. Knowing that I can damage any internal parts I was extremely careful doing that operation. I split the front from the back of the power unit. I carefully discharged all the capacitors, just in case they had remained charged. After all, the inut circuit was powered by AC about 220 V and I didn’t want to get hurt. After that I started to inspect the circuit. As I could imagine, at least one of the electrolyte capacitors had failed. It had become swollen. Using a solder and a desoldering pump, I removed it and replaced it with a higher grade capacitor with slightly higher maximum voltage and the same capacity. It was a bit bigger but it fit into the footprint of the case. I closed the case and fastened it with PVC band. I could alternatively seal the case using a solder to melt the plastic where the edges join together. 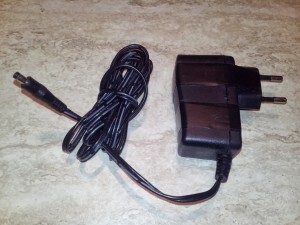 The good attachment is extremely important in environments where children can reach the power adapter. My power unit is put of the reach of children, it remained fastened with PVC band. I tested the power supply. The router was working just fine. The power unit was not too hot, so I did not need to use alternative means of attachment or to make holes in order to improve heat dissipation. 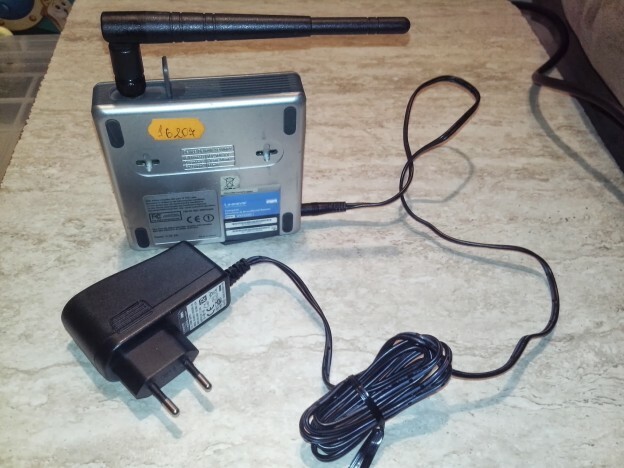 This entry was posted in hardware and tagged capacitor, power supply, repair, wrt54gc on 2013/09/07 by admin.